The Aegean Sea and coastline around Ikaria and its neighboring island chain, Fournoi, are of special interest to scuba divers owing to the region's marine diversity, numerous wrecks, underwater geology, environment and history. Around Ikaria, certified divers can choose from several interesting dive sites including: a rare WWII warplane shot down off the south coast of Ikaria (depth of 17m), a cargo ship sunk off the island's northeast tip (depth of 14-21m), geologically active sea floor hot springs and vents (depth of 10m), natural reef and cave areas and underwater boulder gardens. 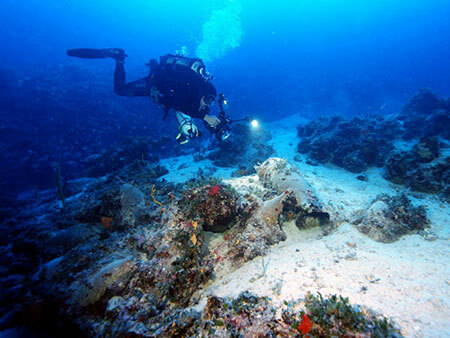 The Founroi Islands Archipelago, Ikaria's neighbor and just 6nm away, was recently discovered to have one of the largest concentrations of ancient shipwrecks in the world! 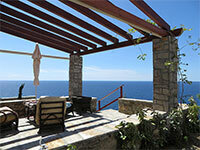 The archipelago, with its pirate history, was always situated at a stratigic location within the Aegean. 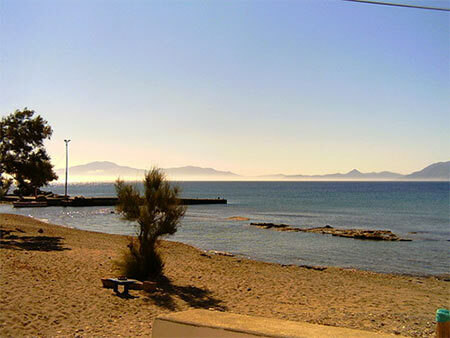 Its location is the meeting point of two major sailing routes, used both in Antiquity and today due to the natural condition of winds in the region. Fourni has 45 documented shipwrecks around its 17 square mile territory and ongoing research is expected to yield more exciting finds. The shipwrecks span from the Archaic Period (700-480 BC) though the Late Medieval Period (16th century). Several wrecks date to the Classical (480-323 BC) and Hellenistic (323-31 BC) periods, but most of the wrecks are from the Late Roman Period (circa 300-600 AD). In general, these wrecks lie just of the coast in shallow and accessible water where unexpected shifting winds and weather caused ancient mariners to be caught off guard while transiting the island's coast or when their ships were resting at anchor. 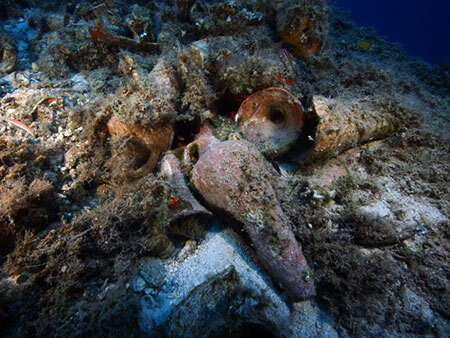 Beside shipwrecks, finds in the area contain jettisoned pottery and ancient anchors. 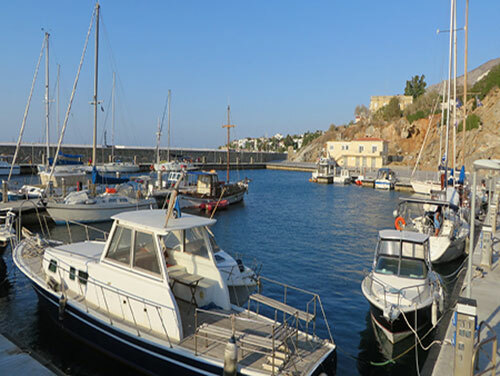 The finds reveal the importance of eastern Mediterranean trade networks passing by Ikaria and Fourni in every time period, connecting the Black Sea and Aegean to Cyprus, the Levant, and Egypt. Never tried scuba? 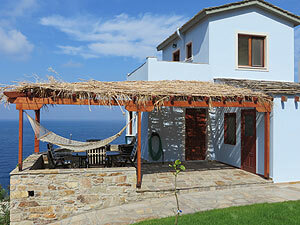 Then why not make a Discover Scuba introductory dive while in Ikaria! 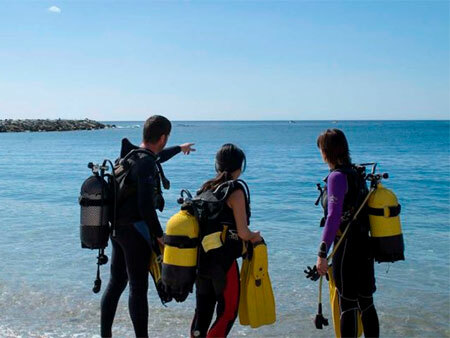 In a brief course you will learn the basics and take a dive in up to 6m of calm water just off Faros Beach or at a local beach near the Amaso Dive shop in Agios Kirikos. Its a safe and great way to experience the fun of diving and the underwater world, and for many first-timers ends up being the first step to getting PADI certified straight away. 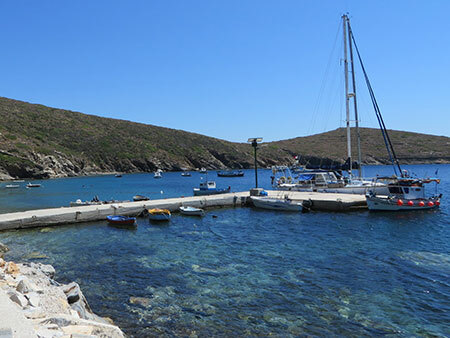 Diving in Ikaria can be organized either as shore based diving or boat trip dives, depending on the dive site, weather and customer preferances and budget. Shore based dives are arranged by the Amaso Dive Center and include PADI certified guide/instructor, your transportation to/from the dive sites, equipment/tanks/wetsuit and box/picnik lunch. 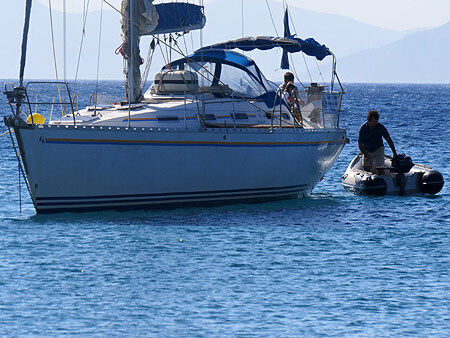 Boat dives are also available and combine a sailing adventure with diving and are based from the new marina in Agios Kirikos in partnership with the Amaso Dive Center and local charter boat owners. 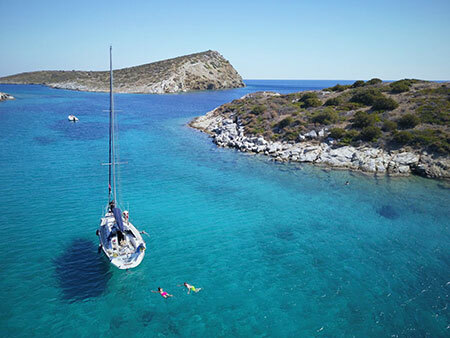 A typical sailing and diving trip includes sailing to locations in Ikaria and Fourni, one or two dives, stops for lunch and swimming fun & relaxtion at a cove or local beach. 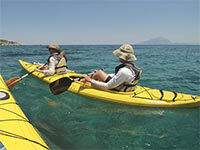 Non-diver guests are welcome on the boat and can enjoy sailing, swimming, snorkeling, kayaking and relaxing on the beach or boat. All equipment and lunch will be provided to non-diver guests and the dive boat crew is coordinating both groups with care & safety. 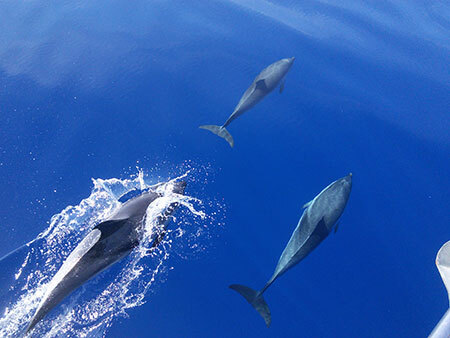 Island Ikaria Outdoor Activities in partnership with the AMASO Dive Center offers Scuba Diving Sailing Trips around Ikaria and Fourni Islands. Spotting Dolphins on the way to Fournoi. 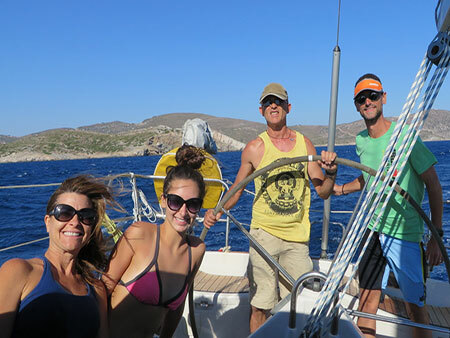 Sailing fun from Ikaria to Fournoi. Preparing for diving while anchored at a local spot in Ikaria. The AMASO Dive Center in Ikaria is owned and operated by PADI Certified Open Water Dive Master and Instructor Yiorgos Raptis. Born on the island but having lived and worked in California for much of his life, Yiorgos has always been in touch with the ocean. 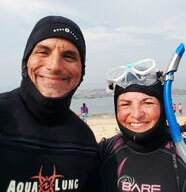 Living and diving on California's Golden Coast for over 28 years, Yiorgos has extensive experience as a professional Padi Dive Master & Dive Instructor, and has guided and trained 100s of divers in his career. He is happy to have brought his expertise, training and enthusiasm for safely showing others the wonderful world of diving back to his beloved Ikaria. Don't miss the chance to dive with Yiorgos and his team on your next visit to Ikaria and see how beautiful Ikaria is underwater as well as on land! The AMASO Dive Center offers a full range of PADI diving courses, local dive trips (Shore Based & Boat Trips), diving equipment sales and rentals and diver services. Explore the Diving Areas & Sailing Route on the map below. Click on points/icons for Dive Trip Photos.